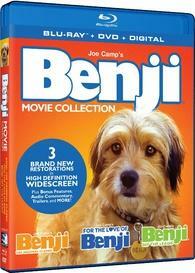 Benji is back with a tremendous trio of films that transformed this lovable mutt into a Hollywood superstar! BENJI The Original Classic - The movie that catapulted Benji into international stardom. A unique motion picture all told from the heart and soul of a dog. BENJI: OFF THE LEASH Benji is back in this charming story that's told from the pooch's point of view, tracking his early days as a pup to his current life in showbiz!